Value is of the utmost importance to Canadian travellers, and deals help guide their decision-making process. More than 90 percent said they look for deals before making a decision, and more than 50 percent said ads can be influential in their planning process. 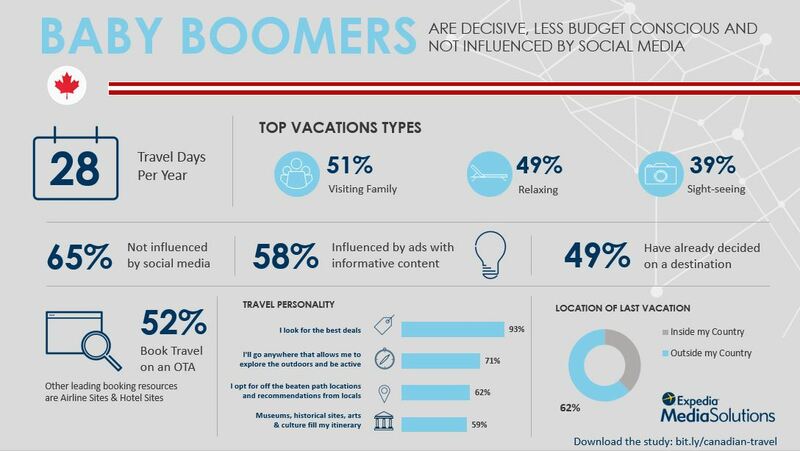 The findings, from a survey we conducted with Northstar Research Partners, showcase broad travel trends in the Canadian market, including the motivations, preferences and attitudes of travellers across four generations: Generation Z, Millennials, Generation X and Baby Boomers. 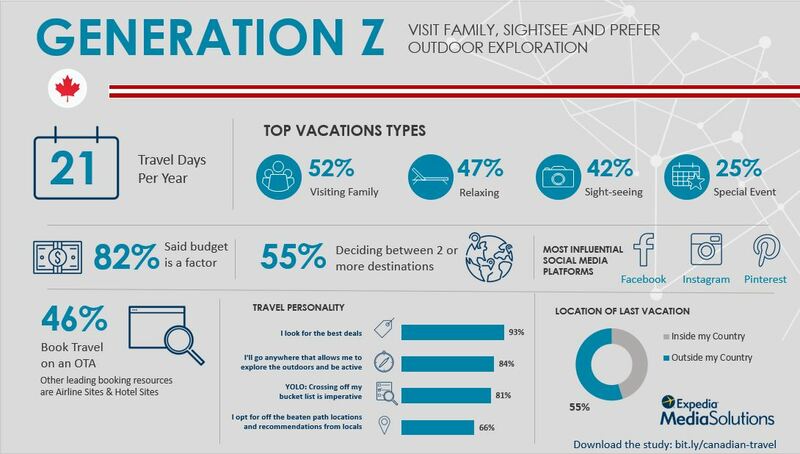 Gen Z travels 21 days a year, and although they have a budget in mind when planning a trip, they are the most open-minded when it comes to destination inspiration. They rely on search engines and online travel agencies (OTAs) for planning and booking, prioritize activities and once in a lifetime experiences, and rank highest in the #YOLO mindset (81 percent) and going places where they can explore the outdoors and be active (84 percent). They are also most likely to be influenced by social media (82 percent); nearly 55 percent said Facebook and Instagram can influence or inspire their decisions, while 23 percent turn to Pinterest, and 18 percent to Snapchat. 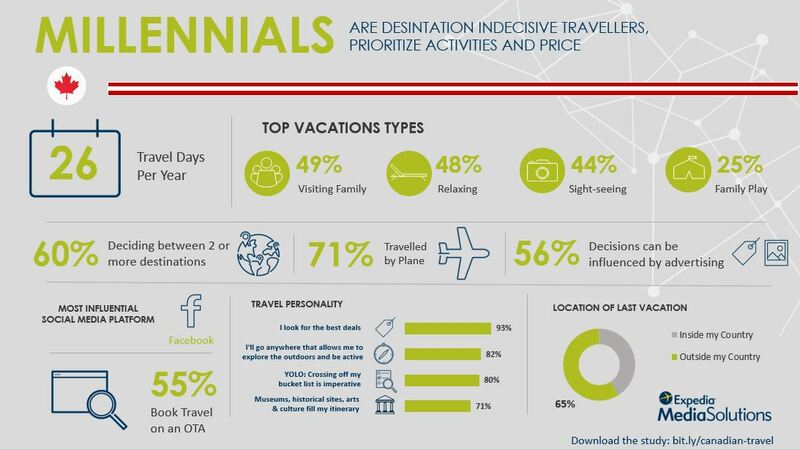 Millennials travel 26 days a year and prefer to explore international destinations, as they are most likely to travel beyond their borders (65 percent). Tackling their bucket list, #YOLO experiences and finding off the beaten path locations are important to Millennials, but they also look to fill their itinerary with museums, historical sites, arts and culture more than other generation (71 percent). Millennials are the most destination indecisive: 60 percent are deciding between two or more destinations, signaling they may have destination overload or are ambitious travellers, with a lot of destinations on their bucket list. 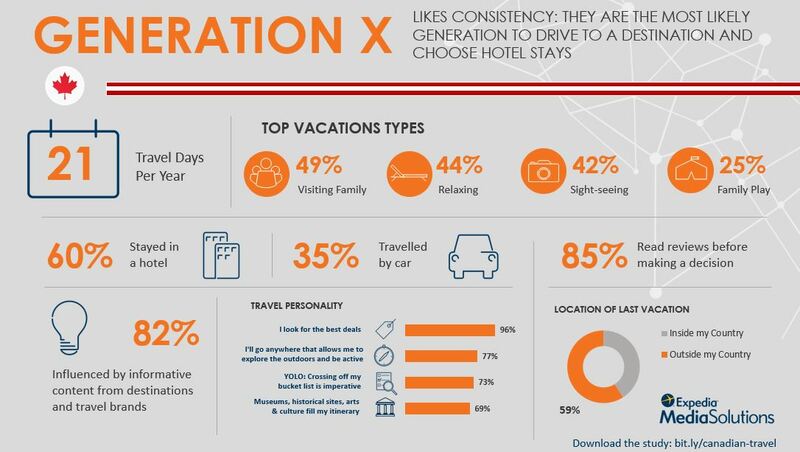 Gen X travels 21 days a year, chooses hotel stays more than any other generation, and are most likely to travel by car. More than 50 percent turn to OTAs for planning and booking, and they prioritize activities, deals and the lowest price when booking a trip. 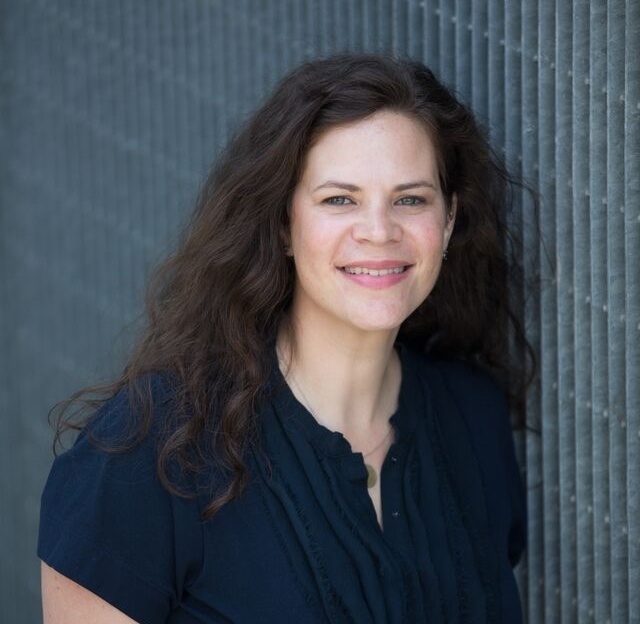 More than 80 percent of Gen X said informative content from destinations or travel brands can be influential and 85 percent read reviews before making a final decision. Compared to other generations, Baby Boomers travel the most (28 days a year) and nearly 50 percent have already decided on a destination when they decide to take a trip. They are more likely to take an international getaway than stay within their own borders and are also quite adventurous once they get to their destination. Boomers are less likely than other generations to stay with family or friends, but are more likely to stay in a resort. More than 40 percent of Boomers said ads with helpful reviews can be influential in their decision-making process, while 58 percent said they can be influenced by ads with informative content.